From conventional U-bolt design to the patented Quick Clamp System the choice is yours. For the easiest to use, ergonomic design, with easy-closure struts. Carfit® Smart Cargo Luggage Boxes are guaranteed to be free from manufacturing defects for a period of 5 years from date of purchase. Please retain your purchase receipt to confirm warranty coverage. This warranty does not cover impact damage or issues occurring due to incorrect fitment or over-loading. 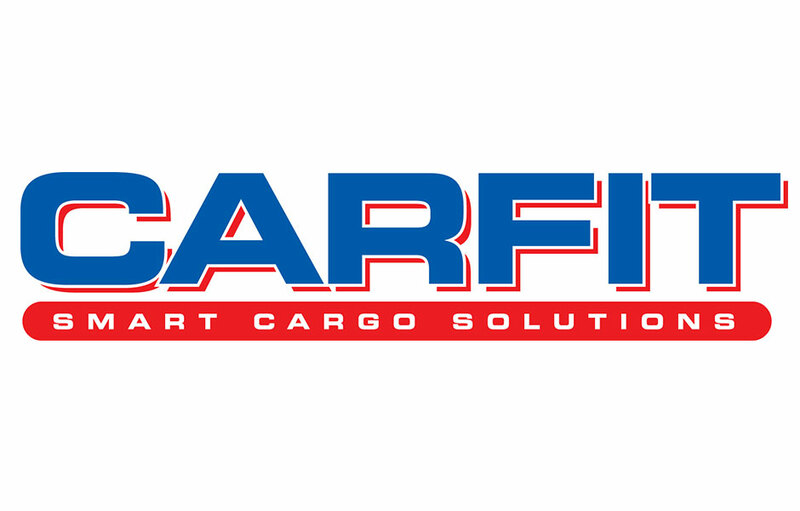 Carfit Smart Cargo Solutions conceived and realised a new kind of quick attachment system of the box to the car roof. The system allows a quick and easy assembling process; moreover it keeps the box in complete stability and safety, as proofed by tests at the TÜV Centre. The quick attachment has been conceived with a very ergonomic and easy to use handle, and includes a practical hand gear for easier closure with its appropriate holding. The external component, attached to the bars, has a plastic cover for several reasons: to raise the grip of the fixation, to make the box more silent and to protect the cars roof bars. Carfit Expedition: A high range pod features an aggressive, lineal, dynamic and stylish design. The patented quick clamp attachment system with conformable handle and small gas struts to provide excellent ease in opening and closing. High gloss black, silver and white finishes make it a standout on any vehicle. 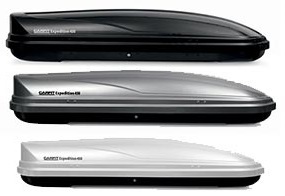 Carfit Travel Twin: With a clean and slender shape and dual side opening, this unique aerodynamic and leading edge design reflects modern car trends and requirements of today. The Carfit Travel Twin comes with the patented quick clamp attachment system with conformable handle and small gas struts to provide excellent ease in opening and closing, and is ideal for those who love sports and leisure activities through its optimised volume design. The glowing metallic silver finish on the Carfit Travel Twin compliments all vehicle colour finishes. Carfit Travel Exclusive: The Travel Exclusive range has been designed and constructed for the most demanding user. The Travel Exclusive has an ergonomic and aerodynamic shape with optimised storage design. With an unsurpassed high end finish, available in either high gloss black or high gloss white finish in 650 litre size. The Travel Exclusive comes with the patented quick clamp attachment system with conformable handle and small gas struts to provide excellent ease in opening and closing. the outdoors in freedom and with all comforts. The brand introduces a new range of luggage baskets for storage and with elevated carrying capacity. Available in a variety of sizes the Carfit Luggage Baskets are strategic and smart products for people who love free time, sports, holidays and above all travelling in a comfortable and joyful way. The luggage trays are electrically coated in resin and powder coated to increase durability from the elements and protect against corrosion. It is advised that the roof bars be wider than the width of the basket to ensure proper fitment. Steel Luggage baskets will fit most vehicles with different mounting positions, U-Bolt clamps are sold separately to suit vehicle roof bars. Carfit Luggage Baskets include a 3 year warranty . 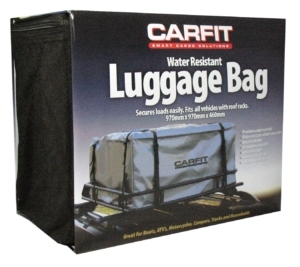 Water Resistant Luggage Bag secures loads easily. Great for Boats, ATV’s, Campers, Trucks and Households. 970mm x 970mm x 460mm.